The history of Major League Baseball is long and intriguing. Thousands of players have come and gone over the decades, but only three men have managed to cement their names as players who have scored more than 700 home runs in their careers. Here, we will look back on the careers of the three absolute giants of the game. “The Sultan of Swat” and “the Bambino” as he was nicknamed, George Herman Ruth, Jr. or Babe Ruth as he was famously called, spent 22 glorious seasons on the ballpark. Known for brilliant hitting, Ruth’s career set the standards for future generations of baseball players. His records of highest career home runs (714), RBI of 2213 (runs batted in), and 2062 bases on balls may have been beaten, but almost a century on, he still holds the record for the highest slugging percentage at 690, and OPS (on-base plus slugging) of 1164. Following his switch from the Boston Red Sox, to the New York Yankees, Ruth established himself as the most prolific slugger in the league. He led the Yankees to 4 World Series Championships, and 7 pennants. He was one among the first five players who were inducted into the MLB Hall of Fame. The dominant force of his era, Ruth became the first player to score sixty home runs in a single season, and is considered as the face of the sport. Henry Louis Aaron, or “Hammerin Hank” and “Hammer” as he was also known, spent 23 seasons on the ballpark playing with MLB teams. Identified among the best players ever, Hank was ranked fifth on the list of “Hundred Greatest Players” by The Sporting News. Having set many records himself, his most prolific achievement was surpassing Babe Ruth’s record of scoring the highest number of career home runs. For eighteen seasons in succession, from 1955 to 1973, he scored 24-plus home runs each year, and remains the only slugger to score 30-plus home runs in fifteen different seasons. Aaron was part of the All-Star team for twenty consecutive years, bagging 3 Gold Gloves. He was the MVP when the Braves clinched the World Series title in 1957. His career records include 2297 RBI, the highest number of total bases at 6856, and the highest number of extra base hits at 1477. He is currently the second highest scorer in MLB history. Barry Lamar Bonds played for the San Francisco Giants and Pittsburg Pirates during his 21-year career. He won the highest number of MVPs in MLB history, including four in succession. He won the Gold Glove eight times and featured fourteen times in the All-Star Game. He holds several MLB records, but none as notable as his 762 home runs. 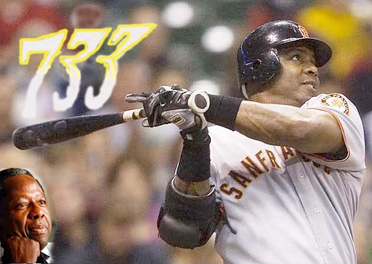 He set a record of 73 home runs, which were scored in the 2001 season alone, and also holds the record for the highest number of walks, as well as intentional walks at 2558 and 688 respectively. Although his career was marred by controversy following the steroids scandal, Bonds will best be remembered for his powerful hitting and all-time record of 762 home runs.